The Martinique is the island's most famous French West Indies for its rum. 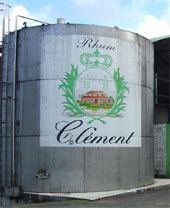 The rum factories, or rather the distilleries and homes, many are in Martinique, a dozen cons 8 or 9 in Guadeloupe. The expertise does not stop at the white rum, rum is the most common sold without aging. The most interesting rums are aged in oak barrels. All years are not vintage. Often the best rums in a dwelling are assembled according to various criteria: age, quantity ... Rums sold in vintage are rare and reserved for exceptional years. In 1638 the sugar cane was introduced to the West Indies. Father Labat will greatly help to boost the production of rum working on gains in productivity, particular with regard to the crushing of the cane. It also introduces the distillation with Stills. The cane is harvested between January and July. It is washed, then pressed boye. Bagasse (fibrous residue) is burned in boilers and contributes to an ecological mode of production. The cane juice , or cane juice freshly obtained is filtered extensively. It is then inserted into stainless steel vats where yeast food assistance to fermenting. Rum thus obtained does not exceed 5 ° then. Its introduction and heated in the still may do so up to 70 °. The rum is then cut with pure water (distilled or if the water source) to reduce between 50 ° and 60 °. For connoisseurs, the tastings are possible at the place of production, usually up to 6 or 7 years of age. The very old rums from 10 years of age are rarely available for tasting. Rum is considered old when it is aged in oak barrels. The martinica have developed a unique know-how, both common to the island and specifically for each dwelling. Like a fine wine, each house has its own distillery or trademark that differentiates producers and years are never the same. Add to bookmark this page Martinique " Rum in Martinique " - Firefox do "Ctrl D"